Seen the benefits of black chokeberry on Oprah. Love the ones I got from you. All 10 are doing well. Black Chokeberry plant lovers who are interested in planting Black Chokeberry to enhance one's landscape, here are some important things to know when considering these flowery shrubs. 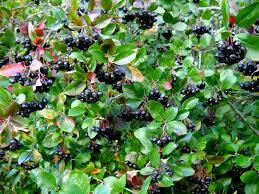 The Black Chokeberry is an adaptable durable shrub that is native to Minnesota. The Black Chokeberry thrives in both Fall and Spring seasons, with an explosion of black fruit in the fall, a mature height is 3 to 8 feet and a width of 2 to 6 feet. Black Chokeberry shrubs include dark green, fine-toothed leaves of 1-3", along with white, five-petaled flowers with showy pink flowers. Black Chokeberry is a North American deciduous shrub. From its species name, melanocarpa, it bears black fruits, features white flowers as well as red fall foliage. Black chokeberry is a tough shrub that has a broad tolerance to some soil densities, textures, moisture conditions and pH levels. It spreads to form a round shape. This shrub grows well in wet and dry locations and in areas where the soil is acidic or alkaline. It thrives well in areas whose soil texture is sandy, loam or clay. It also does well in soil with a pH of 5.1 – 6.5, but it can tolerate higher values. The black chokeberry's growth speed can be described as slow to fast depending on the prevailing environmental factors. Black Chokeberry leaves emerge in a medium green color and measure 1 -3".